Basis of the information contained on this site is Chris Eve's Kodak Collection which was sold in 2005. When there weren't any cameras left, the website was taken offline but as I thought it very useful, here it is again. 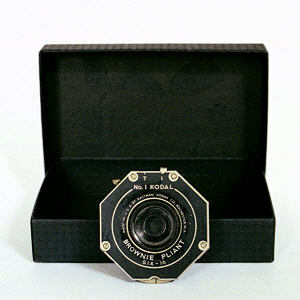 The focus of the original website was on the technical properties of the cameras in the collection and the stories behind the cameras were few. I would like to add more stories and background information to place the cameras in a historical context and try to make them come alive. I hope the information is as useful to you as it is to me. In case you find any mistakes or have additional information feel free to contact me.